Article 5(5)(b) of Regulation (EU) No 515/2014 allocates EUR 791 million for developing IT systems supporting the management of migration flows across the external borders, subject to the adoption of the relevant Union legislative acts. Article 15 of Regulation (EU) No 515/2014 empowers the Commission to adopt a delegated act establishing the breakdown of the amount referred to in Article 5(5)(b) of Regulation (EU) No 515/2014 for developing IT systems, in the case where the breakdown of such amount is not made in the relevant Union legislative acts. Regulation (EU) 2017/2226 of the European Parliament and of the Council (2) establishes the Entry/Exit System (EES). The EES is a central component of the IT systems referred to in recitals 1 and 2. In addition, it is crucial that the implementation of Regulation (EU) 2017/2226 starts without further delay, so that the system is fully operational by 2020, as planned. Article 64 of Regulation (EU) 2017/2226 specifies the costs incurred in connection with the implementation of the EES that would be borne by the general budget of the Union thereby supporting these costs at a 100 % rate. However, that provision determines neither the size of extra funding that will be dedicated to cover those costs, nor its breakdown per type of costs and beneficiaries. From the financial envelope provided for in Article 5(5)(b) of Regulation (EU) No 515/2014, an overall allocation of EUR 480 241 000 should be made available to cover the costs linked to the application of Article 64(1) and (2) of Regulation (EU) 2017/2226. Of that overall allocation, an amount of EUR 287 863 000 should be made available to the European Agency for the operational management of large scale information systems in the area of freedom, security and justice (‘eu-LISA’) to cover in accordance with Article 37 of Regulation (EU) 2017/2226, the costs related to the establishment and operation of the EES Central System, the Communication Infrastructure, the National Uniform Interface (NUI), the web service and the data repository referred to in Article 63(2) of Regulation (EU) 2017/2226, as provided in Article 64(1) of that Regulation. Of that overall allocation, an amount of EUR 192 378 000 should be made available to the Member States to cover the costs incurred in connection with the integration of the existing national border infrastructure and its connection to the NUI, as well as in connection with hosting the NUI, as provided for in Article 64(2) of Regulation (EU) 2017/2226. In addition, that amount should cover the costs linked to the establishment and operation of the NUI as referred to in Article 64(1) of Regulation (EU) 2017/2226, as those costs are incurred both by eu-LISA and the Member States. In accordance with the second subparagraph of Article 64(2) of Regulation (EU) 2017/2226, the amount of EUR 192 378 000 cannot be used to support the costs listed in that subparagraph. However those costs would be eligible for funding under the national programmes in the Internal Security Fund established by Regulation (EU) No 515/2014 at the co-financing rate referred to in Article 16(3), (4) and (5) of Regulation (EU) No 514/2014. Given that Regulation (EU) 2017/2226 builds upon the Schengen acquis, Denmark, in accordance with Article 4 of Protocol (No 22) on the position of Denmark, annexed to the Treaty on European Union and to the Treaty on the Functioning of the European Union, decided to implement Regulation (EU) 2017/2226 in its national law. Denmark is therefore bound under international law. This Regulation constitutes a development of provisions of the Schengen acquis in which the United Kingdom does not take part, in accordance with Council Decision 2000/365/EC (3); the United Kingdom is therefore not taking part in the adoption of this Regulation and is not bound by it or subject to its application. This Regulation should therefore not be addressed to the United Kingdom. This Regulation constitutes a development of provisions of the Schengen acquis in which Ireland does not take part, in accordance with Council Decision 2002/192/EC (4); Ireland is therefore not taking part in the adoption of this Regulation and is not bound by it or subject to its application. This Regulation should therefore not be addressed to Ireland. As regards Iceland and Norway, this Regulation constitutes a development of the Schengen acquis within the meaning of the Agreement concluded by the Council of the European Union and the Republic of Iceland and the Kingdom of Norway concerning the latters' association with the implementation, application and development of the Schengen acquis (5) which falls within the areas referred to in Article 1, Points A and B of Council Decision 1999/437/EC (6). As regards Switzerland, this Regulation constitutes a development of provisions of the Schengen acquis within the meaning of the Agreement between the European Union, the European Community and the Swiss Confederation on the Swiss Confederation's association with the implementation, application and development of the Schengen acquis (7) which fall within the area referred to in Article 1, Points A and B of Decision 1999/437/EC read in conjunction with Article 3 of Council Decision 2008/146/EC (8). As regards Liechtenstein, this Regulation constitutes a development of the provisions of the Schengen acquis within the meaning of the Protocol between the European Union, the European Community, the Swiss Confederation and the Principality of Liechtenstein on the accession of the Principality of Liechtenstein to the Agreement between the European Union, the European Community and the Swiss Confederation on the Swiss Confederation's association with the implementation, application and development of the Schengen acquis (9) which fall within the area referred to in Article 1, Points A and B of Decision 1999/437/EC read in conjunction with Article 3 of Council Decision 2011/350/EU (10). In order to allow for the prompt application of the measures provided for in this Regulation, the Regulation should enter into force on the day following that of its publication in the Official Journal of the European Union. The measures provided for in this Regulation are in accordance with the opinion expressed by experts from all Member States consulted specifically for that purpose. 1. A total amount of EUR 480 241 000 shall be allocated from the general budget of the Union to cover the costs of implementation of Regulation (EU) 2017/2226 in accordance with Article 64 of that Regulation. 2. The amount referred to in paragraph 1 shall be taken from the amount of EUR 791 000 000 earmarked for the development of IT systems referred to in Article 5(5)(b) of Regulation (EU) No 515/2014. EUR 192 378 000 shall be allocated to the Member States to cover the costs referred to in Article 64(2) of Regulation (EU) 2017/2226 as well as the costs incurred in connection with the establishment and operation of the National Uniform Interface as referred to in Article 64(1) of Regulation (EU) 2017/2226. In accordance with Article 64(1) and (2) of Regulation (EU) 2017/2226, the contribution from the Union budget to the costs incurred shall amount to 100 % of the total eligible expenditure. Such contribution shall be allocated in equal shares to the Member States. (1) OJ L 150, 20.5.2014, p. 143. (2) Regulation (EU) 2017/2226 of the European Parliament and of the Council of 30 November 2017 establishing an Entry/Exit System (EES) to register entry and exit data and refusal of entry data of third-country nationals crossing the external borders of the Member States and determining the conditions for access to the EES for law enforcement purposes, and amending the Convention implementing the Schengen Agreement and Regulations (EC) No 767/2008 and (EU) No 1077/2011 (OJ L 327, 9.12.2017, p. 20). Commission Regulation (EC) No 206/2009 (2) lays down rules concerning the introduction into the Union of personal consignments of products of animal origin of a non commercial nature which form part of travellers' luggage, or are sent to private persons as small consignments or are ordered remotely and delivered to the consumer. 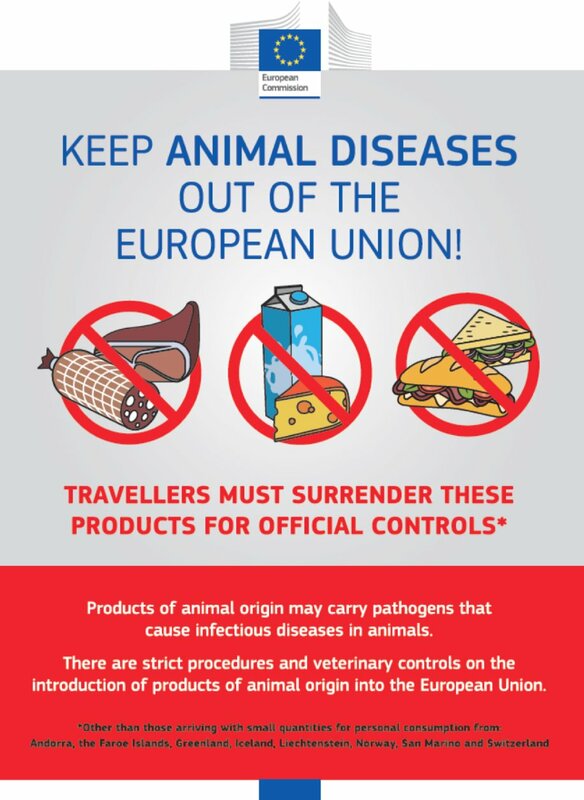 Article 3 of Regulation (EC) No 206/2009 requires Member States to ensure that at all points of entry into the Union, the veterinary conditions applicable to personal consignments introduced into the Union are brought to the attention of travellers arriving from third countries. 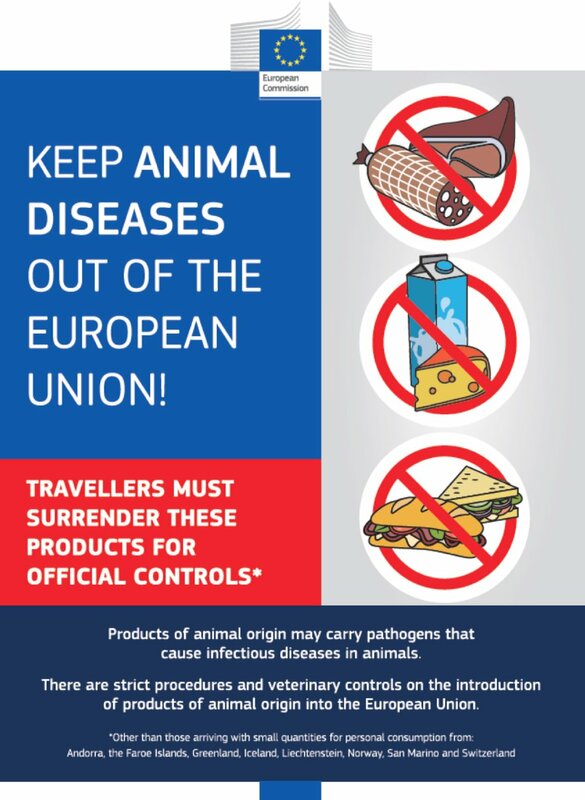 The information to be provided to travellers has to include at least the information contained in one of the posters set out in Annex III to that Regulation. It is appropriate to make the posters available in a new lay out in order to make the information more visible for the travellers and the general public. Annex III to Regulation (EC) No 206/2009 should therefore be amended accordingly. The two posters in the Annex to this Regulation are added to Annex III to Regulation (EC) No 206/2009. (2) Commission Regulation (EC) No 206/2009 of 5 March 2009 on the introduction into the Community of personal consignments of products of animal origin and amending Regulation (EC) No 136/2004 (OJ L 77, 24.3.2009, p. 1). The Minamata Convention on Mercury ‘the Convention’) was concluded by the Union by means of Council Decision (EU) 2017/939 (1) and entered into force on 16 August 2017. Pursuant to Decision MC-1/1 on rules of procedure, adopted by the Conference of the Parties to the Convention at its first meeting, the Parties are to make every effort to reach agreement on all matters of substance by consensus. During its second meeting from 19 to 23 November 2018, the Conference of the Parties to the Convention is to adopt guidelines on the environmentally sound interim storage of mercury, other than waste mercury (the ‘guidelines’). It is appropriate to establish the position to be taken on behalf of the Union at the second meeting of the Conference of the Parties to the Convention, as the guidelines will have legal effects since the Parties to the Convention have to take such guidelines into account when taking measures with regard to interim storage. The Union contributed to the revision of the draft guidelines in the framework of the intersessional expert work launched by Decision MC-1/18, which was adopted by the Conference of the Parties to the Convention at its first meeting. The Union did not consider it necessary to propose further amendments to the revised draft guidelines resulting from that intersessional work. Regulation (EU) 2017/852 of the European Parliament and of the Council (2), and in particular Article 7(3) thereof, complies with the provisions of Article 10(2) of the Convention, as complemented by the revised draft guidelines. The position to be taken on behalf of the European Union at the second meeting of the Conference of the Parties to the Minamata Convention on Mercury (‘COP2’) shall be to support the adoption of the guidelines on the environmentally sound interim storage of mercury, other than waste mercury, referred to in Article 10(2) and (3) of the Convention, as contained in the documents submitted for adoption at COP2. Minor changes to the documents referred to in the first paragraph may be agreed to, in the light of developments at COP2, by the representatives of the Union, in consultation with Member States during on-the-spot coordination meetings, without a further decision of the Council. (1) Council Decision (EU) 2017/939 of 11 May 2017 on the conclusion on behalf of the European Union of the Minamata Convention on Mercury (OJ L 142, 2.6.2017, p. 4). (2) Regulation (EU) 2017/852 of the European Parliament and of the Council of 17 May 2017 on mercury, and repealing Regulation (EC) No 1102/2008 (OJ L 137, 24.5.2017, p. 1). On 26 January 2015, 5 February 2015 and 23 June 2015, the Council adopted Decisions (EU) 2015/116 (1), (EU) 2015/190 (2) and (EU) 2015/994 (3) appointing the members and alternate members of the Committee of the Regions for the period from 26 January 2015 to 25 January 2020. On 5 April 2016, by Council Decision (EU) 2016/552 (4), Mr Thomas KASTRUP-LARSEN was replaced by Mr Erik NIELSEN as a member. On 7 March 2017, by Council Decision (EU) 2017/426 (5), Mr Erik NIELSEN was replaced by Ms Kirstine BILLE as a member and Ms Kirsten JENSEN was re-appointed as a member. Two members' seats on the Committee of the Regions have become vacant following the end of the term of office of Ms Kirstine BILLE and Mr Jens Christian GJESING. Mr Karsten SØNDERGAARD NIELSEN, Mayor Egedal. (1) Council Decision (EU) 2015/116 of 26 January 2015 appointing the members and alternate members of the Committee of the Regions for the period from 26 January 2015 to 25 January 2020 (OJ L 20, 27.1.2015, p. 42). (2) Council Decision (EU) 2015/190 of 5 February 2015 appointing the members and alternate members of the Committee of the Regions for the period from 26 January 2015 to 25 January 2020 (OJ L 31, 7.2.2015, p. 25). (3) Council Decision (EU) 2015/994 of 23 June 2015 appointing the members and alternate members of the Committee of the Regions for the period from 26 January 2015 to 25 January 2020 (OJ L 159, 25.6.2015, p. 70). (4) Council Decision (EU) 2016/552 of 5 April 2016 appointing a member, proposed by the Kingdom of Denmark of the Committee of the Regions. (OJ L 95, 9.4.2016, p. 12). (5) Council Decision (EU) 2017/426 of 7 March 2017 appointing a member and an alternate member, proposed by the Kingdom of Denmark, of the Committee of the Regions. (OJ L 64, 10.3.2017, p. 108). Belgium, Denmark, France, Italy, the Netherlands, Norway, Portugal, Slovenia, and the United Kingdom requested the Commission to set up the European Plate Observing System — European Research Infrastructure Consortium (EPOS ERIC). Greece, Iceland and Switzerland have made known their decision to participate in EPOS ERIC initially as observers. They have agreed that Italy will be the host Member State of EPOS ERIC. Since the United Kingdom notified on 29 March 2017 its intention to leave the Union, pursuant to Article 50 of the Treaty on European Union, the Treaties will cease to apply to the United Kingdom from the date of entry into force of the withdrawal agreement or, failing that, two years after the notification, unless the European Council, in agreement with the United Kingdom, decides to extend that period. As a consequence, after the withdrawal date, and without prejudice to any provisions of the withdrawal agreement, the UK will be considered a third country within the meaning of Article 2(b) of Regulation (EC) No 723/2009 for the purposes of this Implementing Decision. Regulation (EC) No 723/2009 has been incorporated in the Agreement on the European Economic Area (EEA) by Decision of the EEA Joint Committee No 72/2015 (2). The Commission has, pursuant to Article 5(2) of Regulation (EC) No 723/2009, assessed the application and concluded that it meets the requirements set out in that Regulation. 1. The European Plate Observing System — European Research Infrastructure Consortium named ‘EPOS ERIC’ is set up. 2. The essential elements of the Statutes of EPOS ERIC are set out in the Annex. This Decision is addressed to the Kingdom of Belgium, the Kingdom of Denmark, the Hellenic Republic, the French Republic, Iceland, the Italian Republic, the Kingdom of Netherlands, the Kingdom of Norway, the Portuguese Republic, the Republic of Slovenia, the Swiss Confederation and the United Kingdom of Great Britain and Northern Ireland. (2) Decision of the EEA Joint Committee No 72/2015 of 20 March 2015 amending Protocol 31 to the EEA Agreement, on cooperation in specific fields outside the four freedoms [2016/755] (OJ L 129, 19.5.2016, p. 85). The following Articles and paragraphs of the Articles of the Statutes of EPOS ERIC provide for the essential elements in accordance with Article 6(3) of Council Regulation (EC) No 723/2009. The principal task of EPOS ERIC shall be to establish and operate the distributed European Plate Observing System and to provide an effective governance framework to drive the integration and coordination of the Thematic Core Services (TCS) and build and provide governance for the Integrated Core Services (ICS). any other related action necessary to achieve its aim. EPOS ERIC shall pursue its principal task on a non-economic basis. EPOS ERIC may carry out limited economic activities provided that they are closely related to its principal task and that they do not jeopardise the achievement thereof. EPOS ERIC shall record the costs and revenues of its economic activities separately and shall charge market prices for them, or, if these cannot be ascertained, full costs plus a reasonable margin. These activities shall not be covered by tax exemptions. EPOS-ERIC shall have its statutory seat in Rome, Italy. The European Plate Observing System is set up as a European Research Infrastructure Consortium (ERIC) under Regulation (EC) No 723/2009, named and hereinafter referred to as ‘EPOS-ERIC’. EPOS-ERIC shall be established for an initial period of 20 years. That period may be extended by a two-thirds majority decision of the General Assembly. The winding-up of EPOS-ERIC shall be decided by the General Assembly in accordance with Article 10 of the Statutes. Without undue delay and in any event within 10 days after adoption of the decision to wind up EPOS ERIC, EPOS ERIC shall notify the European Commission about the decision. Assets remaining after payment of EPOS ERIC debts shall be apportioned among the members in proportion to their accumulated annual contribution to EPOS-ERIC as specified in Article 9 of the Statutes. Without undue delay and in any event within 10 days of the closure of the winding-up procedure, EPOS ERIC shall notify the Commission thereof. EPOS ERIC shall cease to exist on the day on which the European Commission publishes the appropriate notice in the Official Journal of the European Union. EPOS ERIC shall be liable for its debts. The members are not jointly liable for the debts of EPOS ERIC. The members' and permanent observers' financial liability for the debts of EPOS ERIC shall be limited to their respective contribution provided to EPOS ERIC as specified in Article 9 of the Statutes. EPOS-ERIC shall take appropriate insurance to cover the risks specific to the construction and operation of the EPOS-ERIC. EPOS ERIC data access policy shall follow the best international practices with respect to public data, such as those established by the European Union and shall recognise the rights of the owners of data. EPOS ERIC shall be a facilitator of research and shall, as a general rule, encourage open access following the FAIR principles to research data, data products, services and software, as well as research facilities. Where there are differences in policies relating to data sharing and physical access rules, EPOS ERIC will encourage a culture of openness and sharing within public research communities and within members, observers and beyond. Access shall be based on open access principles following criteria, procedure, and modalities defined in the EPOS ERIC Implementing Rules. Procedures and evaluation criteria shall be made publicly available on the EPOS ERIC website. The activities of EPOS-ERIC shall be evaluated every 5 years by an independent panel of international, external evaluators of the highest quality, appointed by and reporting to the General Assembly; the panel shall carry out scientific evaluations of the activities of EPOS ERIC. EPOS ERIC shall encourage researchers to make their research results publicly available also through EPOS ERIC. EPOS ERIC shall use multiple channels to reach the target audiences, including web portal, newsletter, workshops, presence in conferences, articles in magazines and news media. The term ‘Intellectual Property’ (IP) shall be understood in accordance with Article 2 of the Convention Establishing the World Intellectual Property Organisation signed on 14 July 1967. The intellectual property rights of EPOS ERIC data and other knowledge produced and developed within the activities of EPOS ERIC shall belong to the entity/ies or to the person/s that/who has generated it. The exchange and integration of intellectual property between members or representing entities shall be subject to the Implementing Rules approved by the General Assembly. The Implementing Rules shall also address terms of confidentiality of the exchanged data. Intellectual property generated as a result of activities funded exclusively by EPOS ERIC shall be the property of EPOS ERIC. EPOS ERIC shall comply with applicable legislation on data and privacy protection. EPOS ERIC employment policy shall be governed by the laws of the country in which staff is employed and habitually carries out its work. The selection procedures, recruitment and employment for EPOS ERIC staff positions shall be transparent, non-discriminatory and respect equal opportunities. All positions in EPOS ERIC shall be announced publicly. EPOS ERIC shall treat procurement candidates and tenderers equally and without discrimination. EPOS ERIC procurement policy shall respect the principles of transparency, non-discrimination and competition. Detailed rules on procurement procedures and criteria shall be set out in the Implementing Rules. Procurement by members and observers concerning EPOS ERIC activities shall be done in such a way that due consideration is given to EPOS ERIC needs, technical requirements and specifications issued by the relevant bodies. The Trade Agreement between the European Union and its Member States, of the one part, and Colombia and Peru, of the other part (2), (hereinafter ‘the Agreement’) has been provisionally applied with Peru since 1 March 2013 (3) and with Colombia since 1 August 2013 (4). Ecuador has acceded to the Agreement by means of a Protocol of Accession (5), which is provisionally applied since 1 January 2017. Article 209 of the Agreement provides for the possibility to add new geographical indications to Appendix 1 to Annex XIII to the Agreement after having completed the objection procedure and after having examined the geographical indications as set out in Article 208 thereof. Colombia submitted to the Union a request to add new geographical indications to Appendix 1 to Annex XIII to the Agreement. The Union has completed the objection procedure and the examination of nine new geographical indications of Colombia. Article 257(2) of the Agreement provides that the Sub-Committee on Intellectual Property, established by the Parties in accordance with Article 257(1) of the Agreement, is responsible for assessing the information referred to in Article 209 of the Agreement and for proposing to the Trade Committee, established by the Parties in accordance with Article 12(1) of the Agreement, the modification of Appendix 1 to Annex XIII to the Agreement. On 5 October 2018, the Sub-Committee on Intellectual Property assessed the information in relation to the nine new geographical indications of Colombia and proposed to the Trade Committee to modify Appendix 1 to Annex XIII to the Agreement accordingly. Article 13(1)(d) of the Agreement establishes that the Trade Committee is responsible for evaluating and adopting decisions envisaged in the Agreement regarding any subject matter which is referred to it by the specialised bodies established according to the Agreement. Pursuant to Article 14(3) of the Agreement, in the cases referred to in Article 12(4) any decision shall be adopted by the EU Party and the signatory Andean country concerned and shall have effect only between those Parties. The matter falls under the provisions of Article 12(4) as it relates exclusively to the bilateral relationship between the EU Party and Colombia, and has been discussed in a bilateral session of the Sub-Committee on Intellectual Property. The modifications of Appendix 1 to Annex XIII to the Trade Agreement between the European Union and its Member States, of the one part, and Colombia, Ecuador and Peru, of the other part, set out in the draft Decision of the Trade Committee, are hereby approved on behalf of the European Union. The draft Decision of the Trade Committee is set out in the Annex to this Decision. The Head of the Union Delegation in the Trade Committee is authorised to approve the decision of that Committee on behalf of the European Union. After its adoption, the Decision of the Trade Committee shall be published in the Official Journal of the European Union. Done at Brussels, 14 November 2018. (1) OJ L 354, 21.12.2012, p. 1. (2) Trade Agreement between the European Union and its Member States, of the one part, and Colombia and Peru, of the other part (OJ L 354, 21.12.2012, p. 3). (3) Notice concerning the provisional application between the European Union and Peru, of the Trade Agreement between the European Union and its Member States, of the one part, and Colombia and Peru, of the other part (OJ L 56, 28.2.2013, p. 1). (4) Notice concerning the provisional application between the European Union and Colombia, of the Trade Agreement between the European Union and its Member States, of the one part, and Colombia and Peru, of the other part (OJ L 201, 26.7.2013, p. 7). (5) Council Decision (EU) 2016/2369 of 11 November 2016 on the signing, on behalf of the Union, and provisional application of the Protocol of Accession to the Trade Agreement between the European Union and its Member States, of the one part, and Colombia and Peru, of the other part, to take account of the accession of Ecuador (OJ L 356, 24.12.2016, p. 1). On 11 February 2014 Colombia submitted to the Union its request to add new geographical indications to Appendix 1 to Annex XIII to the Agreement pursuant to Article 209 of the Agreement. The Union has completed the objection procedure and the examination of nine new geographical indications of Colombia. On 5 October 2018, pursuant to Article 257(2) of the Agreement, the Sub-Committee on Intellectual Property, in a session between the EU Party and Colombia, assessed the information in relation to the nine new geographical indications of Colombia and proposed to the Trade Committee to modify Appendix 1 to Annex XIII to the Agreement accordingly. Appendix 1 to Annex XIII to the Agreement should therefore be modified. In the table under point (a) ‘Geographical Indications of Colombia for agricultural and foodstuff products, wines, spirit drinks and aromatised wines’ in Appendix 1 to Annex XIII to the Agreement, the entries in the Annex to this Decision are added. This Decision, done in duplicate, shall be signed by representatives of the Trade Committee who are authorized to act on behalf of the Parties for purposes of modifying the Agreement. This Decision shall be effective from the date of the later of these signatures. Germany, Spain, Italy and Cyprus have submitted requests to the Commission for obtaining derogations as regards the provision of specific statistical data on natural gas and electricity prices. The information/reasons provided by those Member States justifies the granting of derogations. Point 5(a) of Annex II related to the sub-components on network prices and to the sub-components on taxes, fees, levies and charges. Point 5(a) and 5(b) of Annex II related to the three main components and to sub-components on network prices and on taxes, fees, levies and charges for electricity prices, and to the three-level breakdown of these electricity prices. This Decision is addressed to the Federal Republic of Germany, the Kingdom of Spain, the Italian Republic and the Republic of Cyprus. (1) OJ L 311, 17.11.2016, p. 1.